You've added American Girl, Rockefeller Center, Grand Central Terminal, and other attractions to your itinerary. On the 1st (Tue), admire the landmark architecture of Rockefeller Center, stop by American Girl, admire the landmark architecture of Grand Central Terminal, then make a trip to Statue of Liberty National Monument, then make a trip to Central Park, and finally take a stroll through Times Square. On the 2nd (Wed), you'll have a packed day of sightseeing: admire nature's wide array of creatures at Central Park Zoo and then take in panoramic vistas at Top of the Rock. Edinburgh, UK to New York City is an approximately 11.5-hour flight. You can also do a combination of flight and bus; or do a combination of train, flight, and bus. Traveling from Edinburgh to New York City, you'll gain 5 hours due to the time zone difference. In October, New York City is somewhat warmer than Edinburgh - with highs of 24°C and lows of 16°C. You'll set off for Philadelphia on the 3rd (Thu). On the 3rd (Thu), wander the streets of Society Hill and then get engrossed in the history at Independence Hall. Take a bus from New York City to Philadelphia in 1.5 hours. Alternatively, you can take a train; or drive. In October in Philadelphia, expect temperatures between 24°C during the day and 13°C at night. Finish your sightseeing early on the 4th (Fri) so you can take a train to Washington DC. You've added White House, Lincoln Memorial, National Mall, and other attractions to your itinerary. On the 4th (Fri), get a sense of history and politics at White House, take a stroll through Georgetown, see the interesting displays at National Air and Space Museum, appreciate the history behind Washington Monument, then contemplate the long history of Georgetown University, and finally get to know the fascinating history of National Mall. On the 5th (Sat), you'll have a packed day of sightseeing: take an in-depth tour of United States Holocaust Memorial Museum, then get a new perspective on nature at Smithsonian National Museum of Natural History, then contemplate the long history of Arlington National Cemetery, and finally appreciate the history behind Lincoln Memorial. To find ratings, traveler tips, other places to visit, and more tourist information, read our Washington DC day trip planning site . Traveling by train from Philadelphia to Washington DC takes 2 hours. Alternatively, you can drive; or take a bus. October in Washington DC sees daily highs of 25°C and lows of 14°C at night. Cap off your sightseeing on the 6th (Sun) early enough to travel to Charlotte. To find ratings, traveler tips, maps, and more tourist information, use the Charlotte online trip builder . You can fly from Washington DC to Charlotte in 3.5 hours. Other options are to do a combination of train and flight; or drive. In October, daytime highs in Charlotte are 28°C, while nighttime lows are 12°C. You will leave for Savannah on the 7th (Mon). Your day-by-day itinerary now includes Ghost & Vampire Tours as well as River Street Savannah. 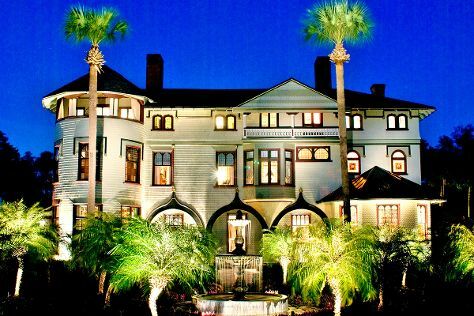 On the 7th (Mon), get thoroughly spooked out with a ghost and vampire tour and then take a stroll through Savannah Historic District. To find ratings, other places to visit, maps, and more tourist information, refer to the Savannah route maker tool . Traveling by combination of flight and taxi from Charlotte to Savannah takes 3 hours. Alternatively, you can fly; or drive. Traveling from Charlotte in October, expect a bit warmer with lows of 18°C in Savannah. Wrap up your sightseeing by early afternoon on the 8th (Tue) to allow enough time to drive to Kissimmee. Your cultural itinerary includes sights like NASA Kennedy Space Center Visitor Complex and Dunlawton Sugar Mill Gardens. Step out of the city life by going to Andy Romano Beachfront Park and Ormond Beach. Venture out of the city with trips to Beach at Daytona Beach (in Daytona Beach), DeLand (Stetson Mansion & St. Barnabas Episcopal Church) and St. Peter the Fisherman Episcopal Church (in New Smyrna Beach). Plan for a day of cool, family-friendly fun on the 14th (Mon) at Legoland Florida Resort. The adventure continues: kick back and relax at Cocoa Beach, putt your heart out at Congo River Golf, identify plant and animal life at Circle B Bar Reserve, and find something for the whole family at Fun Spot America. For photos, reviews, traveler tips, and other tourist information, you can read our Kissimmee trip itinerary planning tool . You can drive from Savannah to Kissimmee in 5.5 hours. Alternatively, you can take a train; or do a combination of flight and bus. Traveling from Savannah in October, plan for a bit warmer nights in Kissimmee, with lows around 23°C. Cap off your sightseeing on the 20th (Sun) early enough to travel back home.